Ladies, would you like to take a bite out of R-Patz? I'll come out and say it - I'm not into Twilight. I haven't read the books, and was forced to watch the first 2 films. Forced, I tell you! It happened like this. For some reason, a few of my friends quite like Twilight. (They say they like to laugh at it, but I'm not so sure, hehehe). One fine morning last week, I logged into Facebook only to see that my friends had decided to get together and watch the first 2 films back to back, and Sandra had offered up our place as the venue! This event was TWINIGHT. 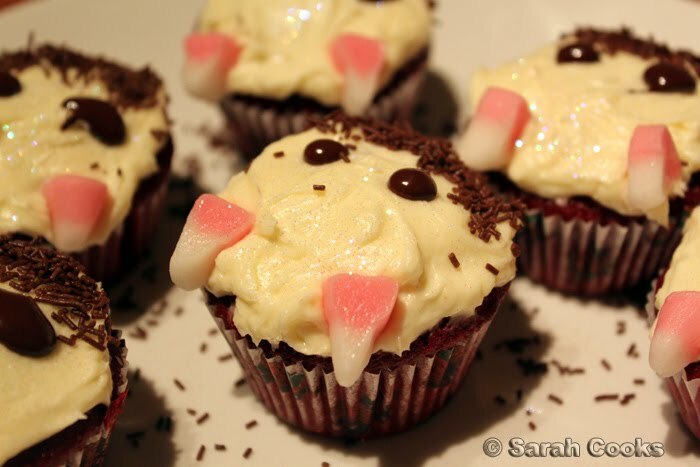 Oh well... if you can't beat them... bake cupcakes! Vampire cupcakes. 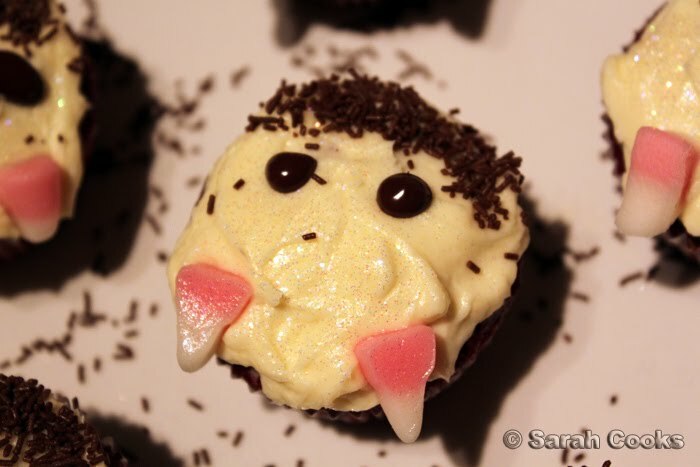 Edward Cullen cupcakes. You'll see that my little babies are a bit rough and ramshackle, but I won't apologise for that. Sugarcraft and fondant will never be my strength, and I can never see the point of making something that looks pretty, but totally inedible. And anyway, I think these little imperfect dudes are cute! To fit in with the vampire theme, I made red velvet cupcakes, with cream cheese icing. 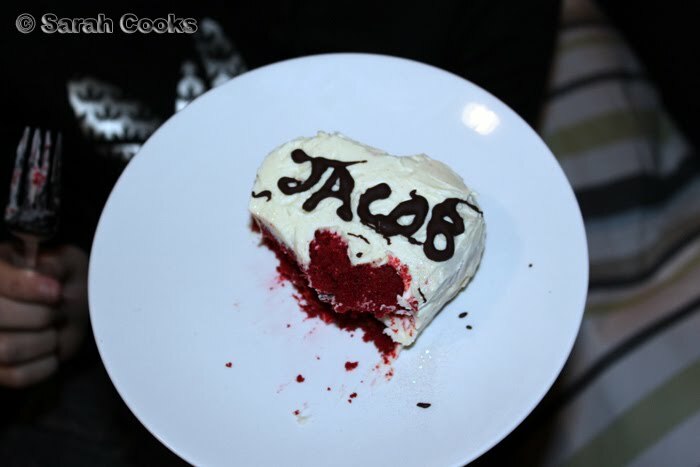 The red represents blood, the cream cheese icing represents R-Patz' pasty skin. 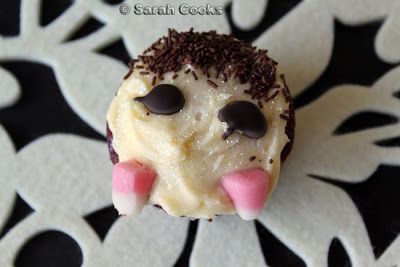 I used Schokorapsels for his hair, piped chocolate eyes, and used teeth lollies for fangs. If you look closely, you'll see I dusted all the cakes with edible glitter in "hologram disco white". And that's dedication, people! Timmy K was charged with the dubious task of renting both Twilight and New Moon from Blockbuster. He excelled at this task, and also borrowed Robsessed - Oh no you didn't! - which is one of those cheaply made British "documentaries" that combine stock footage of Robert Pattinson with interviews of magazine editors and drama teachers that may or may not have a tenuous link with R-Patz himself. 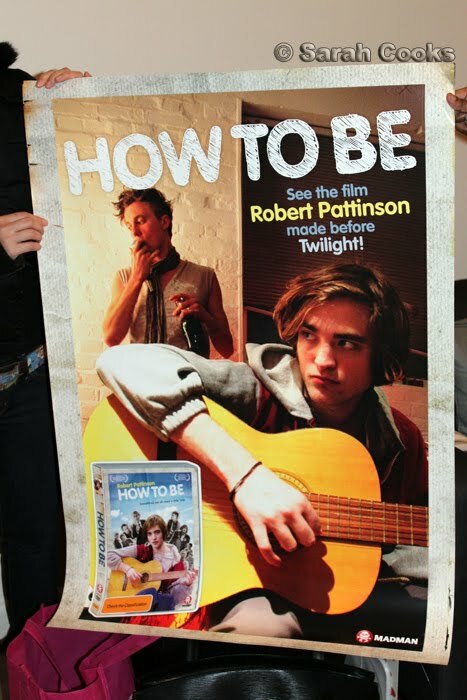 And he also brought us this poster... wow.. I'm just speechless. 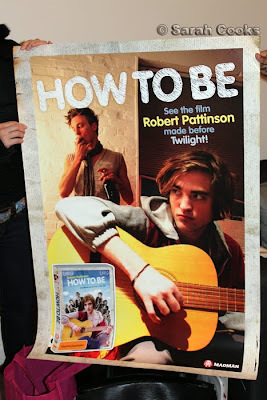 Haha, I love it how they don't even try to hide that they're promoting How to Be as a film with the guy from Twilight! A lot funnier, and less depressing, than the fact that Wuthering Heights is now sold as "Edward and Bella's favourite book". *Bangs head against a wall*. But back to the films. I was decorating the cupcakes while they watched the first one, and was on my computer for the second film, so I'm not entirely sure of the "storyline", but I'm pretty sure it goes something like this. Girl who never smiles moves to shady town. Meets hot, but pale guy. Finds out he's a glittery vegetarian vampire. Er... and that's all I can remember from the first one. But they definitely get together. And she still doesn't smile. Second film - I think the vampire's moved away from the town or something. Her dorky long-haired friend cuts his hair, and is suddenly BUFF. He takes off his shirt at every available opportunity to reveal new tanned and ripped abs and pecs. No-one complains. She still doesn't smile. Vampire comes back at the end of the film, goes to Rome I think? Takes his top off to reveal pasty chest and plans to expose his glittery self in front of a bunch of red-robe wearing religiousy types so that Tony Blair-vampire will kill him. Girl is also in Rome for some reason, and runs across the piazza in slow motion and pushes him back into the shade, thus averting crisis. Not sure if they get back together at the end of this one? 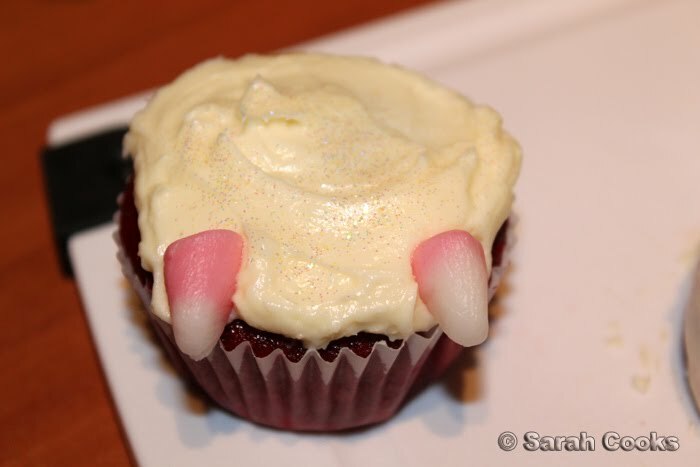 Now that that's out of the way, let's have a closer look at these cupcakes! Pointy fangs. I sliced the tooth lollies into individual teeth, and squished the ends to get them pointy and fang like. Crazy-town red. 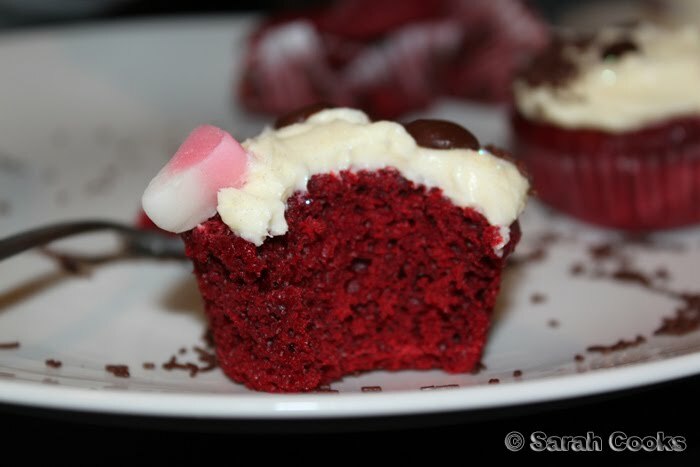 So much red food colouring! 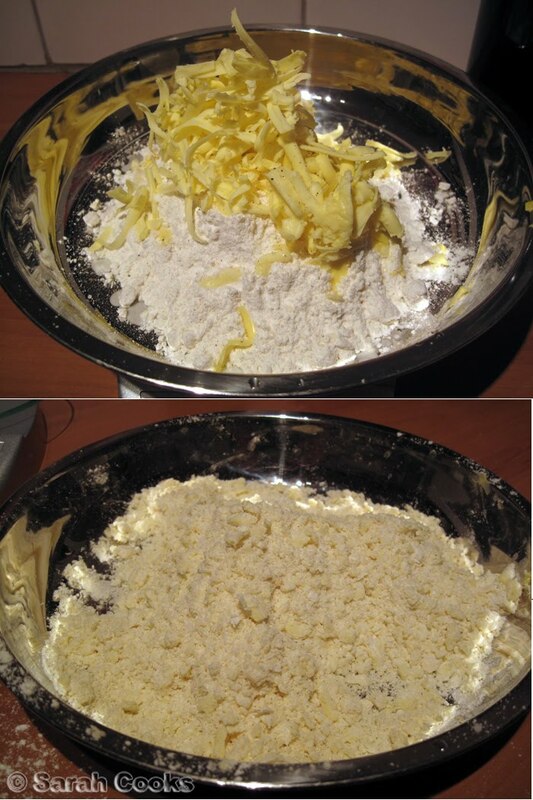 I halved the recipe, which made 12 cupcakes with some leftover batter. 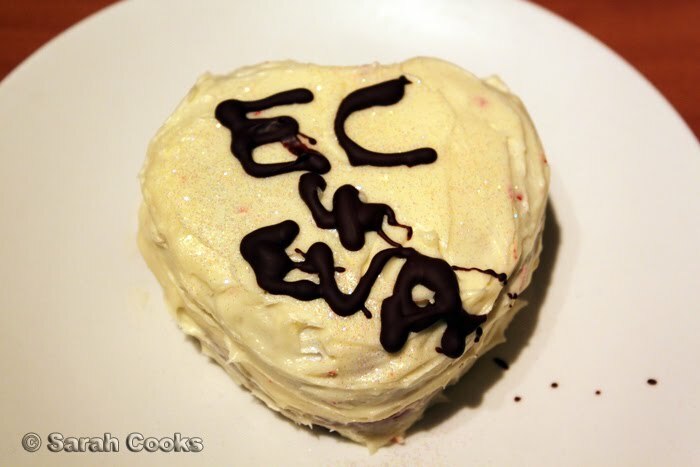 With the extra, I made mini heart-shaped cakes, and very clumsily decorated them with melted chocolate. I love the contast between white icing and red cake. 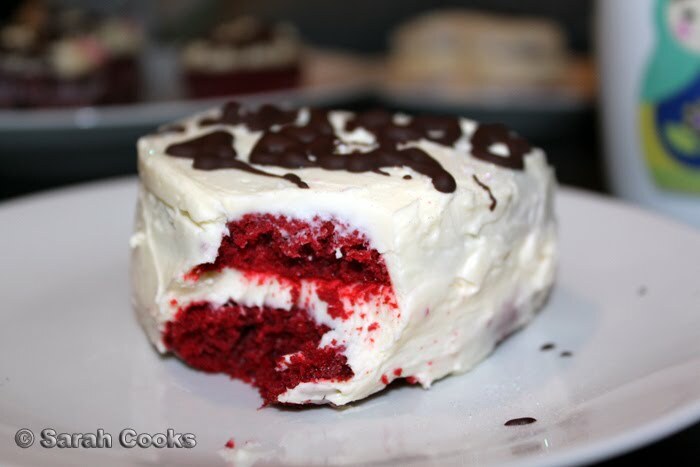 One day I'm going to do the full-sized red velvet cake - 3 layers smothered in white icing, for dramatically pretty slices. Any takers? Sandra ate the below cake, and she was super happy that it looked like a heart under "JACOB". To anyone who's heading out to see Eclipse at midnight tonight, enjoy!! 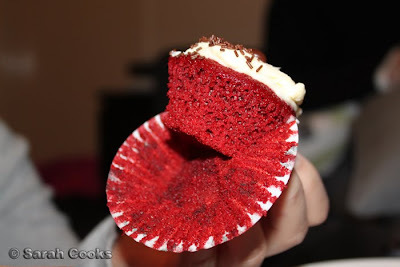 I think I'll stay in and finish off the last cupcake instead. 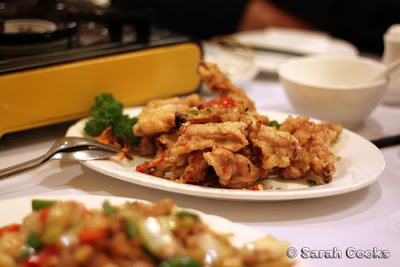 Chrysanthem House is one of my family's favourite restaurants, located in deep suburban Doncaster, right opposite a KFC. 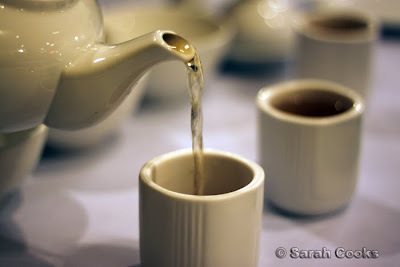 I don't normally blog about my regular haunts, but I feel that this is too good not to share! 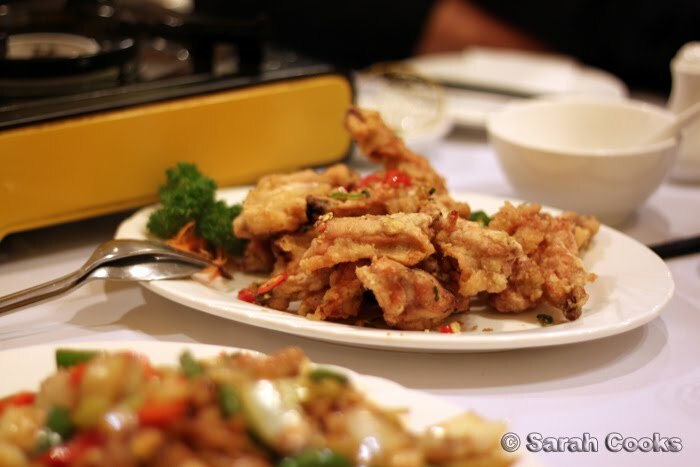 There was a period in time where we'd go almost every week, feasting on fried chicken ribs with salt and chilli, special XO beef with gai laan and mai fan noodles, and fried yong tau foo (that's tofu stuffed with prawns, fried, and smothered in a fabulous savoury sauce). Seeing as we don't read Chinese, we'll usually either order our favourites, take a sticky-beak at what the neighbouring tables are eating, or ask the boss (AKA Fay Lo) for recommendations. Note to self: Make friends with someone who can read Chinese. 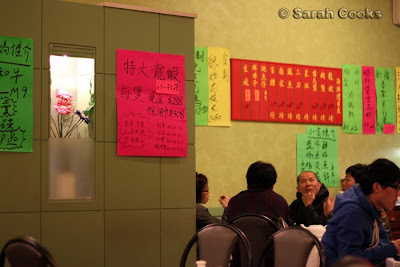 Chrysanthemum House does the supper thing, staying open til 2am. I've noticed that lots of Melbourne's restauranteurs from the Eastern suburbs will come in once they've closed up their own restaurants for the night. One guy I know who runs an Italian restaurant in Kew usually comes here for lemon chicken and beef in black bean sauce (yes, really!) 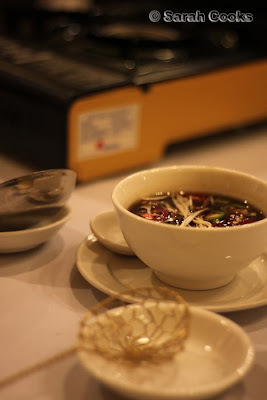 So if you want some classic "kwai lo" dishes done well, Chrysanthem House will be able to sort you out. I hadn't been back to Chrysanthemum House since I moved out of home, until last Friday, when we went for supper with the parentals. My dad recently tried their wagyu beef supper special and thought we'd all love it. He wasn't wrong! I also really needed a good meal. You see, I thought I'd be leaving work on time on Friday arvo, but somehow got called into a 6pm meeting and then had to walk home in the cold and rain. I was absolutely starving and exhausted by the time I got home. The following dishes definitely hit the spot! Deep fried chicken ribs with salt and chilli. In front of the ribs, you can (just) see a plate of Kung Po Chicken. 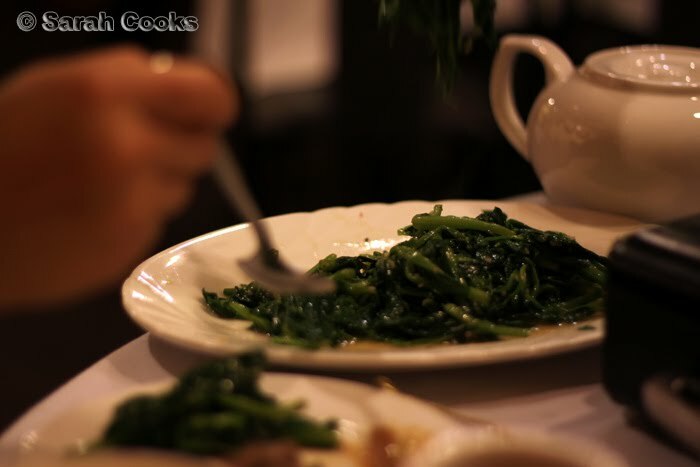 Stir fried snow-pea shoots with garlic. And now the wagyu. For some reason, if you order it during dinner time, it's $90, but if you come for supper (9:30pm onwards), it's only $45. Bargain! You get a big plate with thinly sliced beef sitting atop some raw spinach (see the top of this post for the breathtaking picture). Fay Lo tells us that the beef is 9-grade wagyu, which means the marbling is even throughout the meat, which enhances the taste and texture. You also get a bowl of soy sauce, with thinly sliced chillies, and a super-cool steamboat scoop. And most importantly, you get a big pot of broth on a gas burner. You can choose whatever broth you'd like - chicken, beef, even lamb - but we chose beef to match the wagyu. Let's take a look inside the intensely beefy broth. There are little red dates, coriander, thick pieces of soft-fatty beef (not-wagyu) and some sort of potato. So rich and delicious. 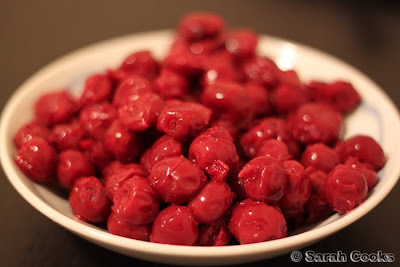 ***EDIT*** Apparently those little dried red things aren't red dates, but wolfberries! 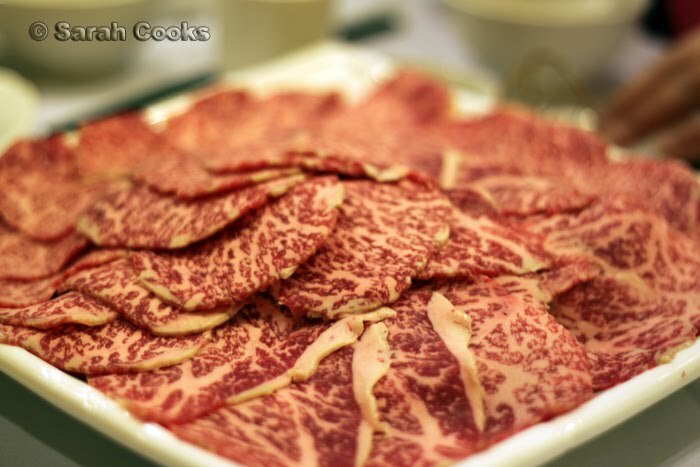 Here's what the fatty, tender non-wagyu beef chunks look like. 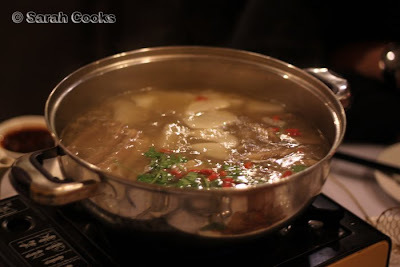 They might not be wagyu, but they taste good too, and are very tender from being slowly cooked in the hot soup. 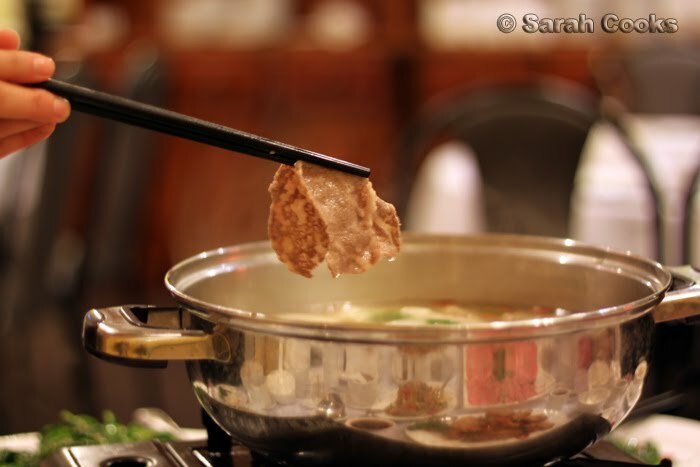 So basically you just do it like steamboat, picking up your wagyu slices and raw spinach, and letting them cook in the hot broth. I don't normally even like steamboat, but this was awesome! The soup just gets more flavoursome and more beefy as you go. It was absolutely perfect on a cold and rainy night, really warming and fortifying. As I drank down the hot soup, all the worries of the week just melted away. 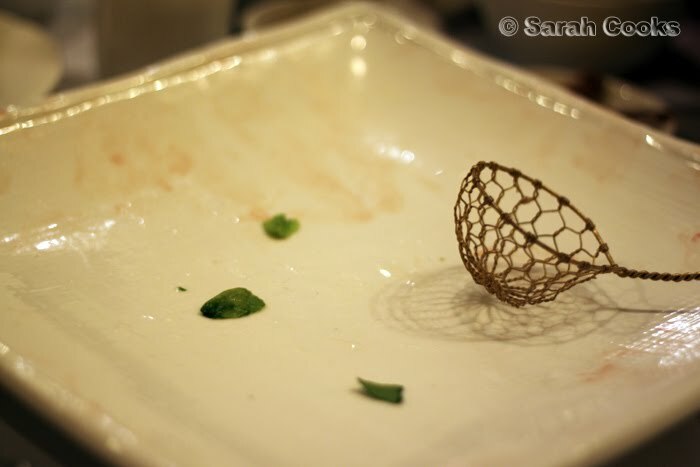 And then, whoops... all the meat was gone! Hot tip - if fatty fatty wagyu isn't your thing, (though, can I ask - Why not?) 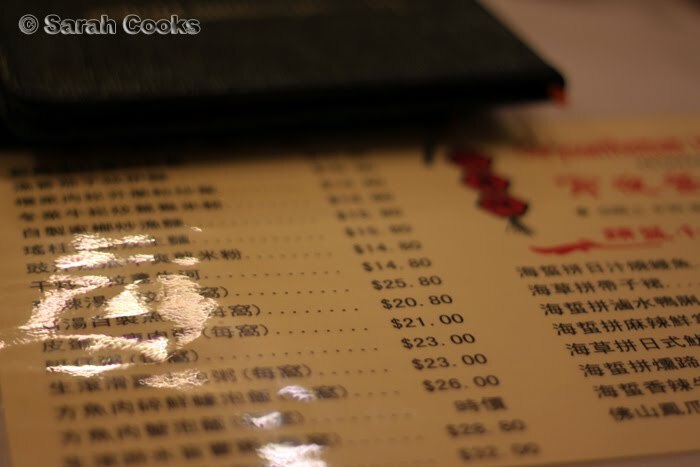 they also do a great barramundi congee, and it's cheaper during supper too! I can't remember the exact price though. If you order the barramundi congee, they'll catch a fresh one for you, put some in your congee, and fry or steam the rest of the fish for you. This meal was total awesomeness, which just proves my theory that Melbourne's best Chinese food is found in the suburbs. 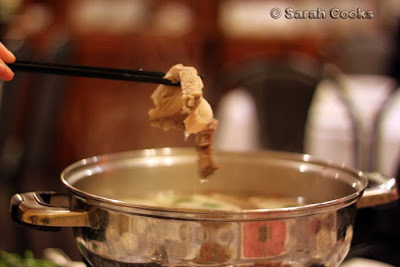 What are your favourite suburban Chinese restaurants? 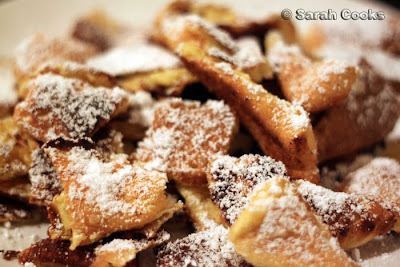 Kaiserschmarrn is an Austrian dessert - small pieces of pancake, fluffy on the inside and crispy on the outside, piled high on a plate and dusted generously with icing sugar. Sounds amazing, right? I thought so too, and had been looking for an excuse to make them for the longest time. That excuse came by this evening, in the form of Thanh. He came over to pick up his new camera lens, I believe there was a brief mention of hunger, and suddenly I was in the kitchen whipping up egg whites and sifting icing sugar. 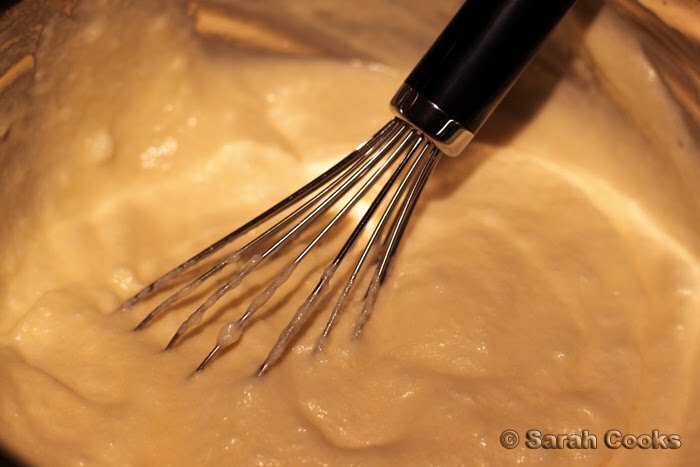 The batter is like a very eggy, sugarless pancake batter, with the egg whites whipped separately and folded in for lightness. 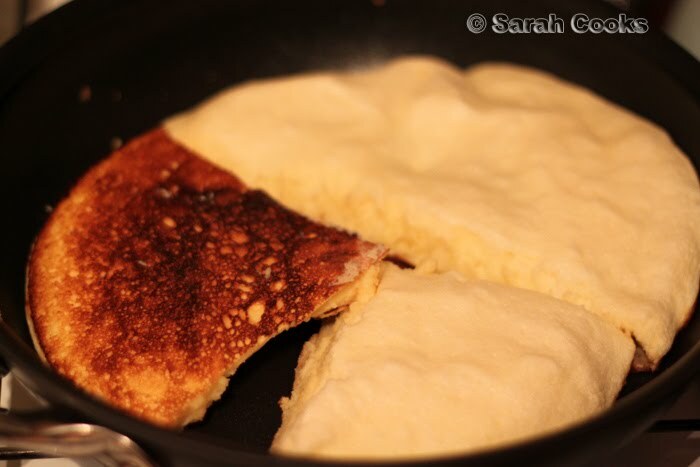 You fry the batter in butter, but instead of trying to flip the whole thing over at once (which would be a recipe for disaster), you cut them into quarters and flip each quarter over separately. 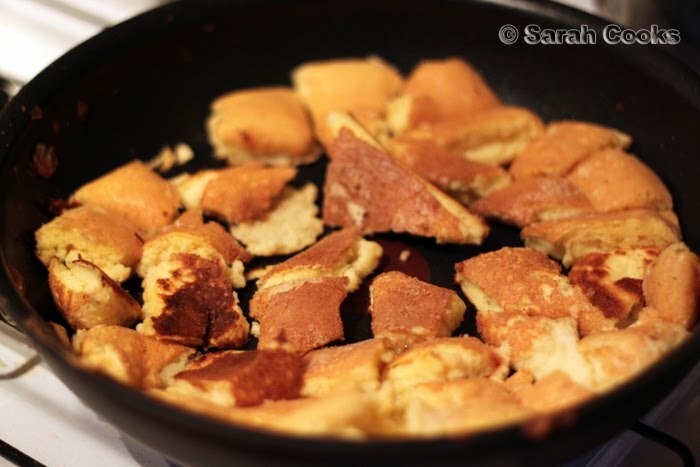 Once the batter is almost cooked through, you cut it up into smaller pieces (just using an egg-flip) and let them cook and become crispy. The recipe I used (from Dr. Oetker Schul Koch Buch) includes raisins in the dough, but we preferred them plain. Well, when I say plain, I mean thickly dusted with icing sugar and with morello cherries on the side. 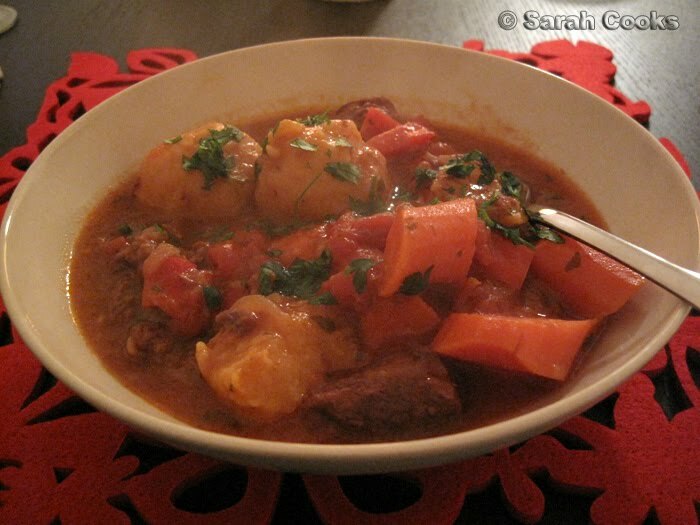 Other traditional accompaniments would be apple sauce or plum sauce. I think maple syrup would go pretty well too! 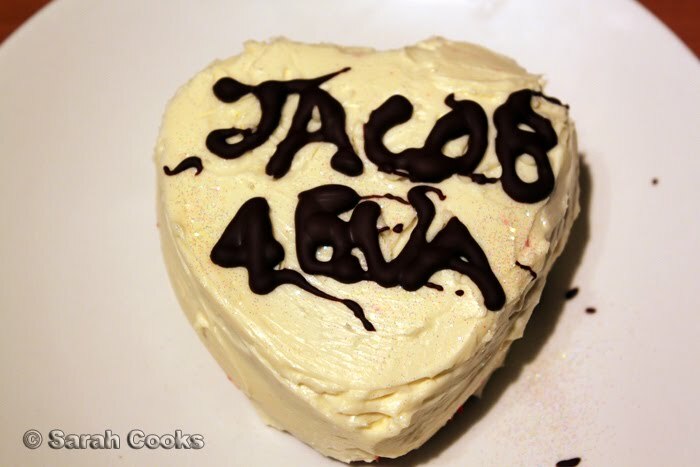 This was a totally winning recipe. 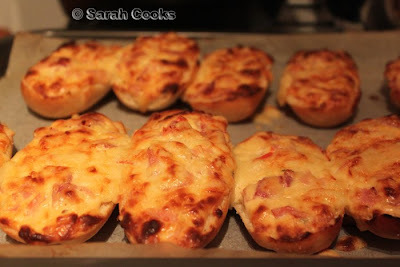 Absolutely delicious, easy to make, all storecupboard ingredients. It went from idea to plate in less than 30 minutes. According to the book, it serves 2, but we found that it served 3 generously. It kinda tasted like poffertjes but without the need for any expensive equipment. I won't post up the recipe because it's very simple and a simple google search will yield many versions. Enjoy!! I made this green tea cheesecake for our housewarming party last night. It's exactly the same recipe as I used before, but with 12g of matcha powder added. 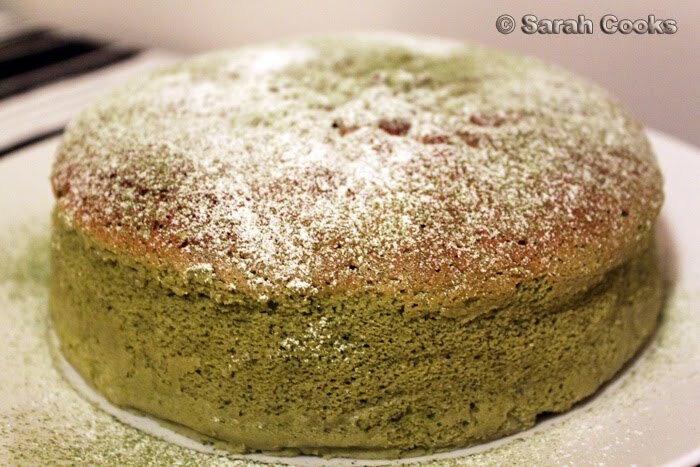 (Big thanks to matcha-expert Catty for the advice!) You'll see it rose a little unevenly, but it still tasted really good and was extremely moist. 12g of matcha powder was just the right strength for me - it had a good, prominent green tea taste, but wasn't bitter at all. We kept the party quite small and casual, serving easy snacky food and lots of drinks. For snacks, we had Nik Nak's (aka addictive spicy German crunchy-coated peanuts), and some Haribo gummi bears. We made Glühwein (just like in the magical Weihnachtsmärkte), which was perfect for this freezing cold weather. For more substanial eats, we made pizza broetchen, both veggo (roast capsicum, mushrooms) and meat (salami, ham). I don't know why, but when you're drinking, salty carby food really hits the spot. 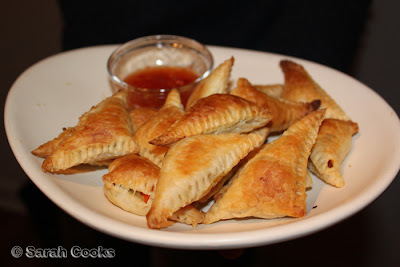 And for the Malaysian contingent, I made curry puffs! My mum normally makes beef and potato ones, and cooks them in a jaffle iron, but I wanted a veggo version, and have no jaffle iron. I also didn't have a recipe, so I just winged it. 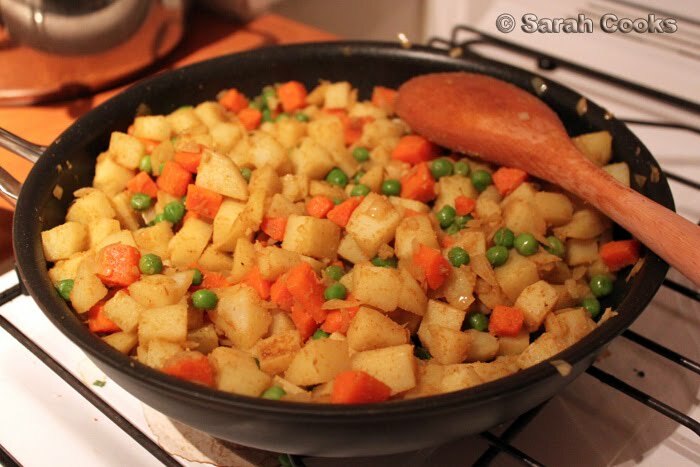 I cooked up some onions with garlic and lots of curry powder, then added cooked and cubed potatoes, carrots and peas. I let it cool overnight, then mashed the mixture roughly with a potato masher and made teensy-weensy little curry puffs with puff pastry triangles. Some of my friends also brought cake. YAY! 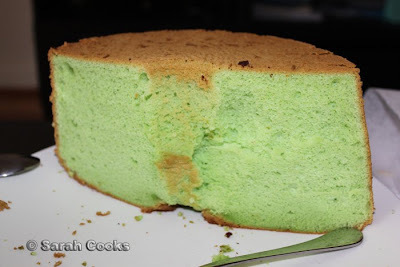 This is Su's amazing pandan chiffon cake. Check out how tall it is! Thanh: Why isn't my pandan cake this tall and fluffy? 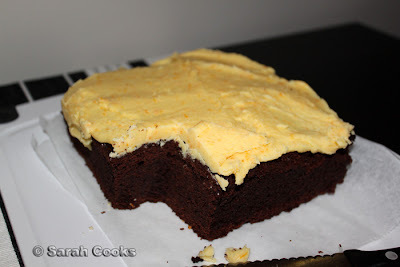 Duncan made a super rich and moist sour cream chocolate cake, topped with mandarin icing. I don't normally even like jaffa, but this one was fab! Can we have the recipe please?? 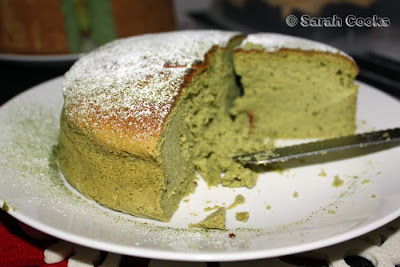 Finally, let's have a look at the inside of the matcha cheesecake. 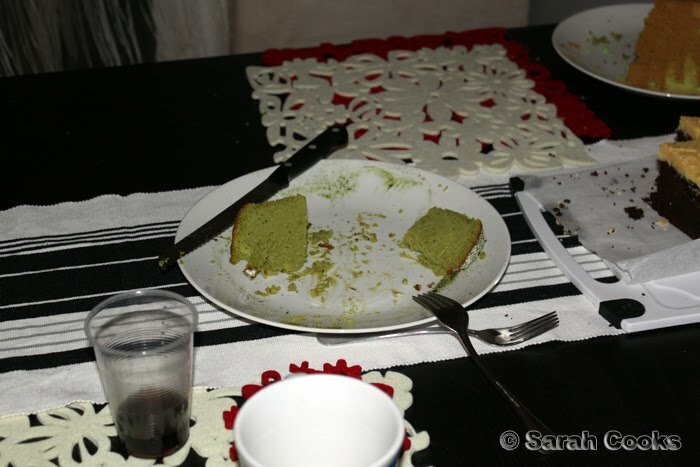 You can see it was really moist, which made it a bit hard to slice, but that didn't prevent us from demolishing the cake. Remnants of cake. Please also notice the awesome snowflakey Venucci Sweet Pea red and white placemats and coasters. A lovely gift from my friends George and Adri. It was so much fun! 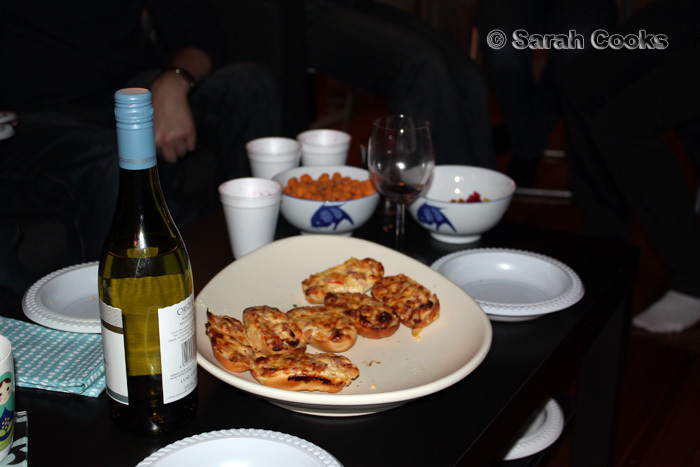 The whole evening was quite chilled, with heaps of people staying quite late and relaxing on the couch. (I suspect this had something to do with the FREEZING weather outside, hehe). The housewarming didn't end until the Argentina Vs. Nigeria match did. We also did the dishes at 3:30 in the morning - SO painful - but how good is it to wake up to a clean kitchen! A couple of friends stayed over, which meant late night chats and late morning coffee and leftover cake for breakfast. What a great way to spend a long weekend! 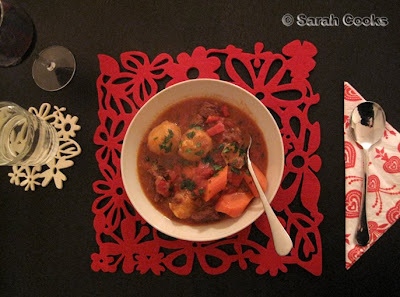 After the cacophony of dainty sweetness of the last post, I thought it was time to show you a good, solid, and hearty savoury meal. Let me introduce to you... Schupfnudeln! 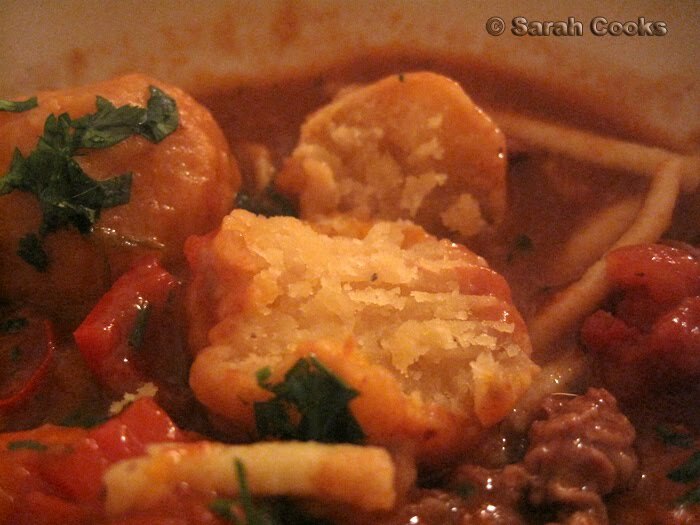 Schupfnudeln are German potato dumplings - you can think of them as thin dumplings, or thick noodles. I made them one night this week, after becoming obsessed by the recipe in my Dr. Oetker Schul Koch Buch that the family in Germany sent to me for Christmas last year. 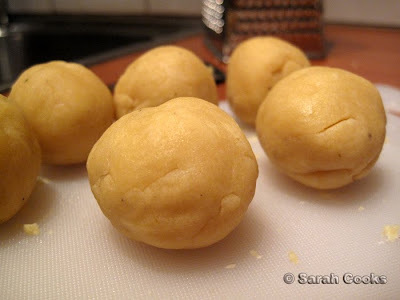 They're a little tricky to make - you have to boil and mash potatoes, then make the mash into a dough, hand roll the little dumpling shapes, boil them and then fry them - but even so, the whole process wasn't too difficult, just a little time consuming. And they are seriously good. 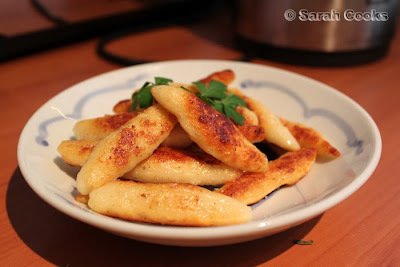 I've translated and posted the recipe below. (You can thank me later, hehe). According to the recipe, you can serve them with goulasch or other stews, just like the creamy paprika chicken served at Muttis. However, Sandra says her Mama back in Germany only makes them with sauerkraut. 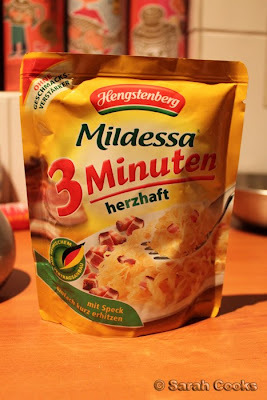 I know sauerkraut is widely available here, but we happened to have a packet of "3-minute sauerkraut" sent over from Germany, so I thought it would be a good opportunity to use that. The packet does say it has speck in it, but I wasn't too sure how much would actually be in the packet, so I added some extra. 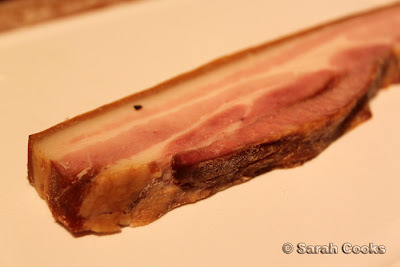 I happened to have a thin piece of speck (AKA Kaiserfleisch) in the freezer, which I defrosted overnight in the fridge. 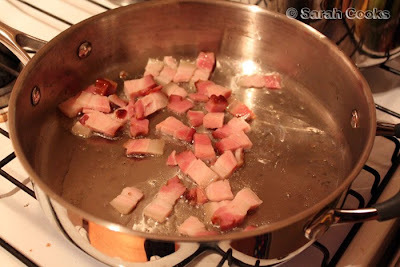 So, I chopped up the speck into thin pieces and fried it in a pan until crispy. 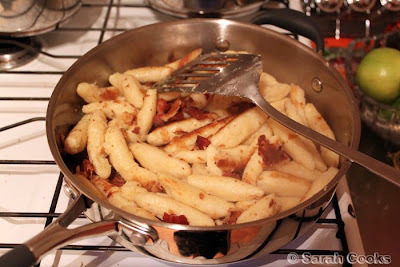 Then I tumbled in the cooked and drained Schupfnudeln, slowly turning them over and scraping them off the bottom of the pan until about three quarters of them were crispy. Then I tipped the packet of sauerkraut over, clamped on a lid and let it cook for - you guessed it - 3 minutes, until the sauerkraut was heated through. 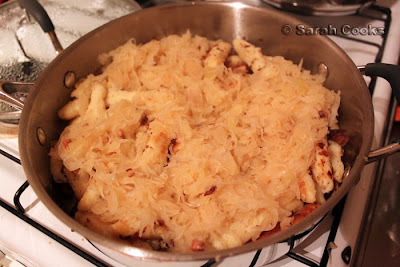 Sauerkraut can be quite strongly flavoured, but the Schupfnudeln are very bland so it works together well. If you were to use pre-made Schupfnudeln (either homemade and frozen, or from a packet), then it would make a very quick midweek meal indeed. 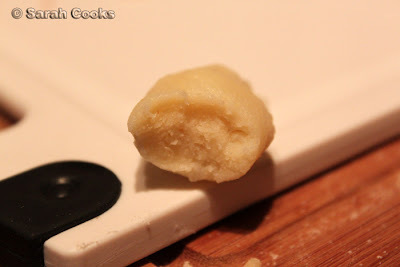 If you look at the top of this post, you'll see that I saved some of the Schupfnudeln and fried them separately in butter to see how they'd turn out. The answer? Crispy and delicious. 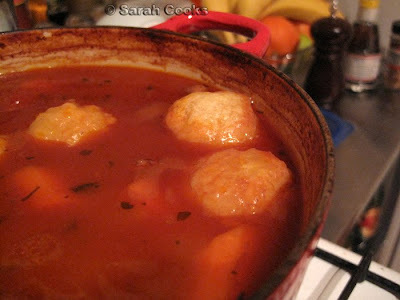 Next time, I'd love to try these crunchy doughy dumplings of awesomeness with a hearty stew. Peel and rinse the potatoes. 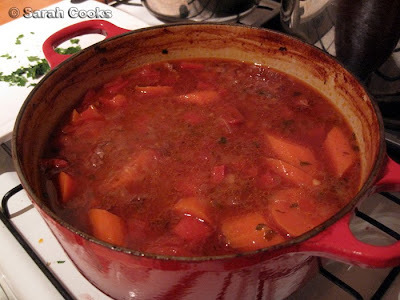 Place the potatoes in a pot, add 1/2 tsp salt, cover with water and bring to the boil. Cover with a lid and cook for about 20 minutes, or until cocked through. Drain and allow to steam dry. 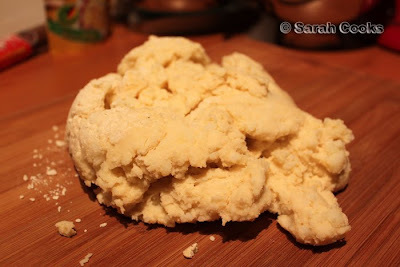 Mash the potatoes with a masher or a potato ricer and let cool. Place the mashed potatoes with the egg, flour, salt, pepper and nutmeg in the bowl of an electric mixer fitted with the dough hook. Mix on a low speed until the dough comes together. Turn onto a floured work surface and knead to a smooth dough. 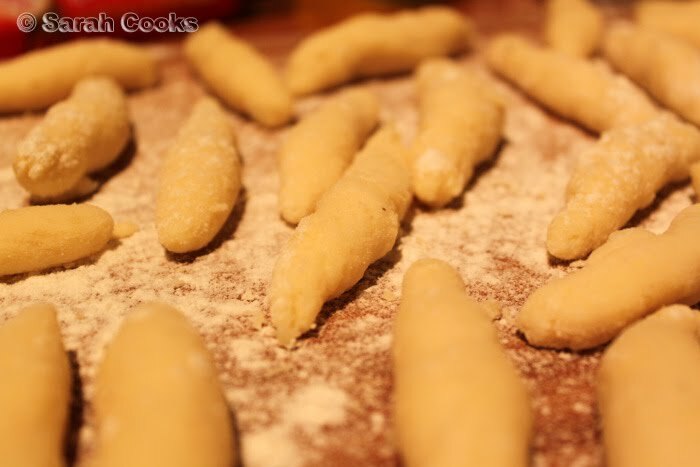 Pinch off small pieces of dough and roll into approx 5cm long Schupfnudeln shapes. (See picture below - the ends should be thinner than the middle). 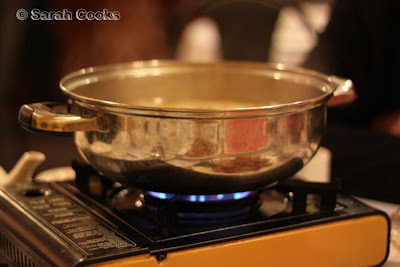 Put a large pan of salted water on the heat and bring to the boil. 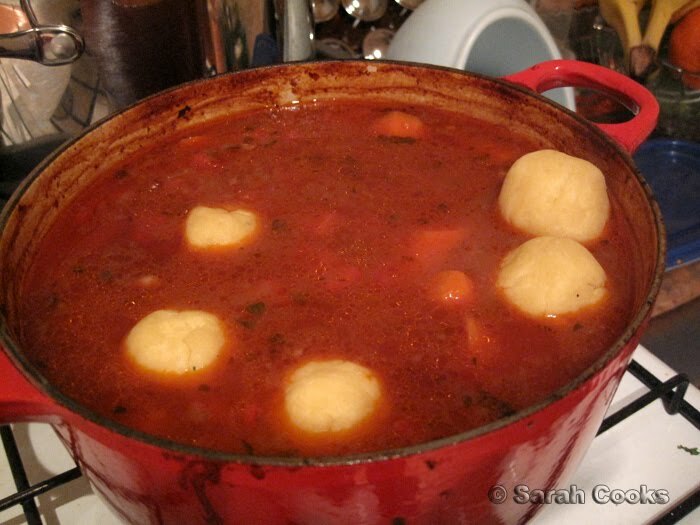 There should be enough water for the Schupfnudeln to "swim" in it. Tip in the Schupfnudeln and cook on a gentle boil (or a strong simmer) for 3-4 minutes. If you want to test if they're cooked, take one out and cut in half. (Or just bite it if you're very hungry and laugh in the face of danger). 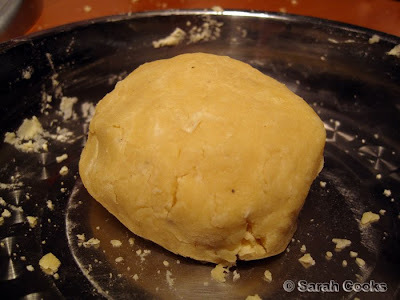 It should be fluffy and doughy inside, as per below picture. Drain and allow to dry. Fry in butter until crispy and serve with goulasch or other stews. 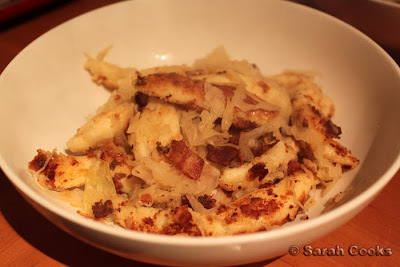 Or, fry in butter and speck as per above example and eat with sauerkraut. Oh, herzhaft und lecker!